OtterBox Defender Series for the iPad Mini is a very durable case made of polycarbonate that also doubles as a stand to view in portrait or landscape mode. A screen protector is built into the shell to protect against scratches. A silicone plug cover keeps dust and debris out of the main openings without interfering with usability. Buyers have reported that its got an excellent fit, the buttons on your iPad Mini still work great in this case, and the silicone backing has a nice grippy feel. On the downside, there is no clear backing/opening to show the Apple logo, and there is no protection for the speaker area. Other cases offer a better choice of colors, and the price might be high for some but Amazon is offering a good discount. 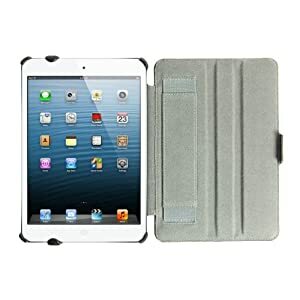 The Snugg iPad Mini case is one of several premium leather cases available. It folds in all the right places, and automatically wakes and puts the iPad Mini to sleep. An elastic hand strap makes it easier to hold and use your iPad Mini. The Stylus loop can be tucked behind your iPad when not in use and the Velcro flap used to secure your iPad tightly in place when in landscape position. This case offers a wide range of colors including Baby Blue, Black, Electric Blue, Orange, Pink, Red, White and Black Executive. This case is very highly rated on Amazon with more than 1,200 5 star reviews. 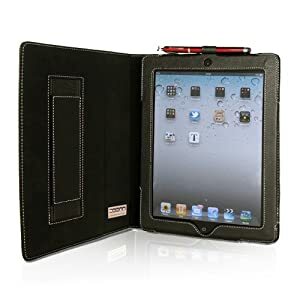 This is a synthetic leather case for your iPad Mini. It is designed for maximum convenience and has the usual features including wake/sleep Smart Cover functionality, precice cut outs for the various ports, buttons and camera holes, and a built-in elastic hand strap for secure grip of the case on the go. Unlike some cases, this one comes with a 3 year warranty provided by i-Blason. This case receives mixed reviews from buyers, with some complaining that it offers a poor fit and is slightly bulky. This is a great case with a very nice feel, sleep and wake function, and very good value for money. 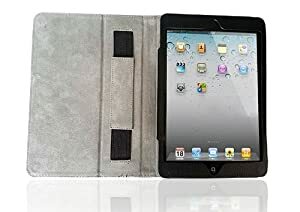 It’s lightweight, makes the iPad easier to carry, has a nice leather exterior, interior lined with microfiber, protects all corners of the iPad Mini, has a magnetic lid, all the ports/buttons are easily accessible, and the excellent elastic hand holding band to let you securely hold the iPad Mini while you’re using it. Buyers agree, this is a sturdy case with great protection, an attractive design and a great price – it’s considerably cheaper than other cases. This case from Bear Motion is a great contender, with 100% genuine leather, a built-in stand, and wake/sleep function. The company touts their rigorous and relentless quality control, claiming consistent quality, and high quality materials ‘guaranteed’. Buyers agree, this company provides excellent service – they are obviously trying hard to sell this product and get their message across. Buyers commend the quality of the case and its excellent value – there’s a massive 70% saving available if you buy on Amazon.